Film Reviews is a critics based blogger template to post reviews about movies, tv serials, plays etc. This template is very much customizable and you can use it for almost any niche. 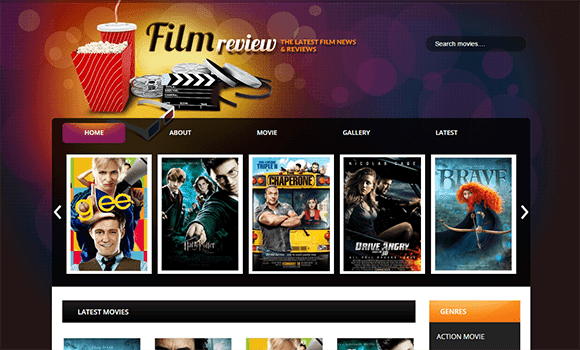 Film Reviews is equipped with various of widgets which will help you to publish your blog more professionally. To make it easy for you we have published this detailed documentation, so that you can setup your blog correctly. You have made a good decision by choosing our template. You can check the live demo or download the template through the button below and also Please Read this documentation carefully in order to set up your blog and please note that there’s no support for free users. > If your label has Space between two words then don't put the label same at it you must fill the same with %20, for example Blogger%20Tips. How can we make it clear for you? Thanks For The Fast Replies. The slider works but only if I stop the site while its loading. When after fully loading it doesn't show up the images of movies on the slider. So I tried to edit the html code, but it's a js fetching the links for it automatically. And from the post what I didn't understand was the filling the same with 20%. does it means like, if my movie name is "The One Man" does it also needs to be The20%One20%Man????. If it is, I think I've done that too. Could you Please provide a solution for that matter? I need to Start the site. Why nobody answers when I have paid the premium version? I need help and I have sent all the possible contact forms ..even what's app!!! buenas noches sora, me dirijo a usted porque compre esta plantilla y la verdad desde que prove el demo me gusto su diseño y decidi comprarla, pero veo que en todas las paginas de mi sitio, el buscador de google me da un alerta de seguridad con una x roja en el lado derecho que dice ( se bloqueo el contenido no seguro ) esta pagina esta tratando de cargar scriptc de fuentes no autentificadas, y eso no me gusta, por favor espero contar con su ayuda para solucionar este error gracias. You need to replace every image url from http to https. You can compare with our demo, since the issue isn't appearing on our demo but on your blog, so the possible chance is that the issue is in your content. There's nothing to worry about since its an old template it is using some outdated api's and script which are causing this issue. Hello, I Just purchased the Film Review Template. My max post on " Latest Movies " is only 7. The demo I saw was about 20 post in page 1. Please guide me how to set the code..